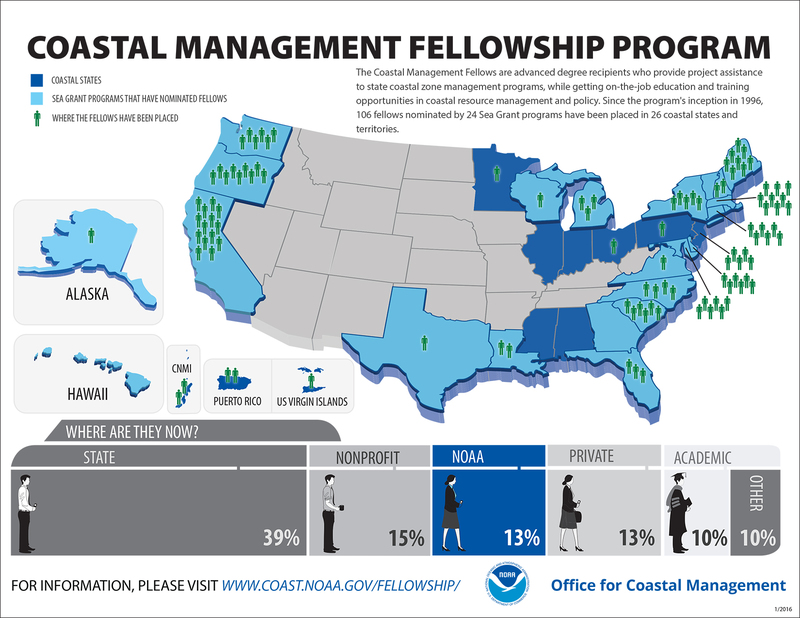 The Coastal Management Fellowship was established in 1996 to provide on-the-job education and training opportunities in coastal resource management and policy for postgraduate students and to provide project assistance to state coastal zone management programs. The program matches postgraduate students with state coastal zone programs to work on projects proposed by the state and selected by the fellowship sponsor, the National Oceanic and Atmospheric Administration (NOAA) Office for Coastal Management. This two-year opportunity offers a competitive salary, medical benefits, and travel and relocation expense reimbursement. Where have fellows been placed and where have they gone on to work?